Whether you’re up-to-date on the latest technology or not, there’s no denying that smart phone apps can make caravanning, camping and motorhoming much easier. Last month, to find out which app is the most popular with all you caravan and motorhome enthusiasts, we asked you to vote for your favourite. Thanks to all who participated. 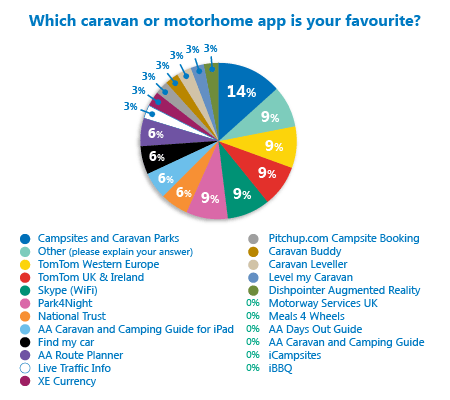 With 22 caravan and motorhome apps to choose from, plus the option to vote ‘other’, we were interested to see which you would vote as your number 1 app. In first place with 14% of the vote is Campsites and Caravan Parks (£1.99), an app that helps you locate campsites throughout the UK and Europe quick and easily. The results were decidedly split for the rest of the top ten though. Unsurprisingly we had a number of well known apps tied for second place with 9% of the vote. These were the satellite navigation app TomTom Western Europe and UK and Ireland, the popular free online calls app Skype and the Park4Night app which allows you to find a places to stay overnight when motorhoming. ‘Other’ also clocked up 9% of the final vote and we explain some the app suggestions in this category below. The National Trust app which allows you to find you nearest National Trust locations was also one of the popular choices amongst voters with 6% of the vote. P Garratt thinks the Ookla WI-FI speed test app is the best as it “saves a lot of frustration” when trying to connect online. Do you agree with the votes? Share your view in the comment box below. Camper Contact is only freedom the test restricted version. The full version is about £6.00 annually. I agree with Deborah Pope. Will not use Apple products as I have found Apple products too restrictive. If it will not work on Android it has targeted consumers. I disagree. I will not touch an Android with a barge pole. Apart from Android copying iPhone’s iOS in the first place and no one able to make a phone of as high a quality, you don’t get Google spying on you and due to Apple’s safe sandboxed approach there are no viruses you Android lot have to put up with. As for Samsung they just try to copy the iPhone as much as they can anyway. You might as well get an iPhone and enjoy a trouble mobile life. You all sound like the old PC lot that used to say how great Windows was when it was absolutely rubbish and far inferior to the Mac. Oh … I forgot … Windows was a copy of the Mac OS just like Android is now. Where would the world be without Apple.